Robert Lee Kanaga passed away Sunday, June 18, 2017 surrounded by his family. Born September 15, 1925, in Winfield, Kansas to Sterling Glandon and Opal LaVerne Kanaga (deceased). Bob is known best for his skills as a pilot, sense of humor and extraordinary integrity. He will be missed greatly. 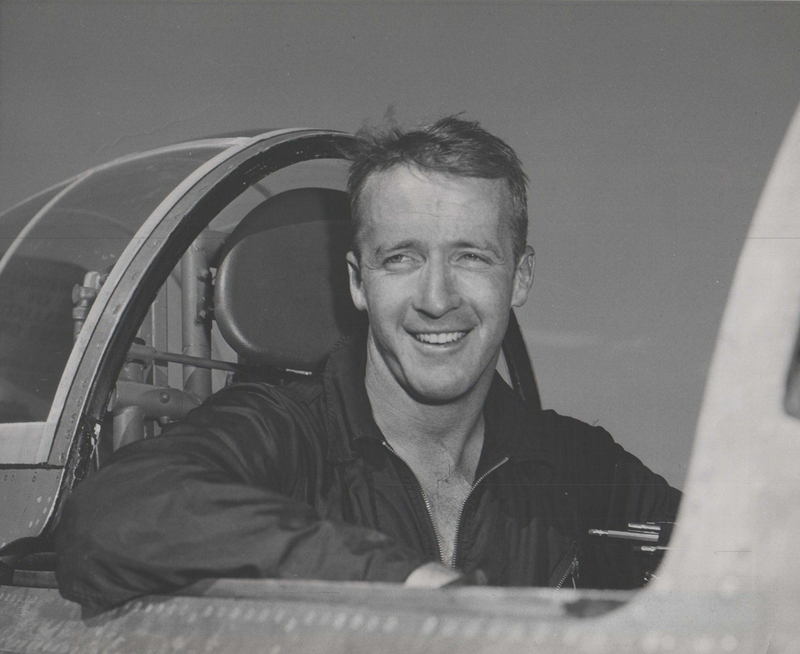 He began his flying career in the United States Air Force. He enlisted at the end of WWII, saw combat in Korea and served during Viet Nam. After serving in Korea he was asked to fly the original slot position for the newly formed air demonstration team the USAF Thunderbirds. He met his wife Maudene Elizabeth Schnepf while a cadet at Williams Air Force Base. He went from active duty to serve in the Arizona Air National Guard. He began farming in Queen Creek, Arizona and became a member of the Arizona Flying Farmers. His Unit was called to serve, flying the Berlin Corridor in Germany in the early 1960’s. He then started flying for the National Forest Service. From there he moved into Corporate Aviation for various business and chartering companies. He retired from the world of aviation at the age of 70. During his 53 year aviation career he has flown everything from Stearman trainers to F-104s, Citations and even helicopters. He is survived by his; children: Sherry (Richard) Harmon, Tracy (Kevin) Grace, Bob (Sydney) Kanaga; grandchildren: Tawna (Nathan) Mower, Taya (Kevin) Goodwin, Summer (Jamie) Armstrong, Richard (Stacie) Harmon, Jade (Jeff) Jarvis, Robert Harmon, Colby (Malea) Grace, Chelsey (Daniel) Adams, Rachael (Scott) Harris, Kamber, Shalayne (Clayton) Wyatt, Lacy (Barrie) Lindahl, Devlyn (Randy) Day, Dallin (Kaylynn) Kanaga and Tanner (Bailee) Kanaga; thirty-four great grandchildren and sister Carol Connor of Chicago, IL. Bob was preceded in death by brothers: LaVerne, Duane, Charles, and sister Charlene (Langhofer). We love you so much Pop. Visitation, Friday, June 23, 2017, 6:00-8:00 p.m. at Bunker’s Garden Chapel, 33 N. Centennial Way, Mesa, AZ. Funeral Services Saturday, June 24, 2017 10:00 a.m. at The Church of Jesus Christ of Latter-day Saints, Harmony Ward Building, 940 E. Southern Ave., Mesa, AZ with visitation 1 hour prior. I will miss Bob very much. I was his caregiver where he lived at in Gilbert. It won’t be the same any more for me, so I thank his family for sharing him with me. I am proud to have known Robert, as the first husband of one of his granddaughters. I very much enjoyed hours of talking to him about his service in the Air Force, and his time with the Thunderbirds. His stories amazed me and I admired him very much. He lived an amazing life, and his kindness and acceptance of me into his extended family is something I will always be greatful for. Our thoughts and prayers are with you all. May you find comfort in the many wonderful memories of Pop. Eternal rest grant unto him O Lord and let perpetual light shine upon him. May he Rest In Peace . Amen. Thinking of you Kanaga kids. Such special memories of your family. Loved your mom and dad . Sherry and Tracy, I remember your folks well. We send you our love and heartfelt condolences.